Under the direction of John Glenn, “Circle Mirror Transformation” by Annie Baker is an oddball comedy that lingers in the mind long after the curtain comes down. Company of Fools will present “Circle Mirror Transformation” at the Liberty Theatre in Hailey today, June 29, at 7 p.m. for an Educator’s Night, as well as on Friday, July 1, and Saturday, July 2, at 8 p.m., and on Tuesday, July 5, at 7 p.m. for a Girls’ Night Out evening. Performances will continue through Saturday, July 23. 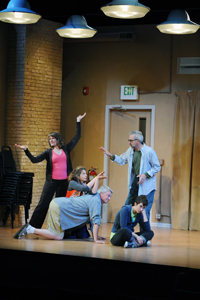 For more information on performance days, times and ticket prices, visit www.companyoffools.org or call 788-6520. The New York Times called the play “an absolute feast.” It is the winner of the 2010 Obie Award for Best New American Play and the comedy triumph was extended twice by popular demand and landed on the Top 10 lists of The New York Times and The New Yorker. The play takes its name from a popular theatre game that involves a group of actors standing in a circle and mirroring—and then transforming—each others’ movements. Glenn said that judging by his 32 years in theater, this play is as interesting as it gets. Tickets are $30 for adults, $20 for seniors 62 and over and $10 for students 18 and under. These ticket prices do not include the Pay What You Feel Preview, 10 for $10, Girlfriends’ Night Out and Educator Nights. A special group rate for groups of six or more will receive tickets at $20 each. To buy tickets, visit www.companyoffools.org, call 578-9122 or stop by the box office starting one hour prior to curtain. Company of Fools’ box office is located at the Liberty Theatre, 110 N. Main St. in Hailey, with hours from 10 a.m. to 5 p.m. Monday through Friday.